Ang, who partnered overnight leader Tun Hakim to win the Doubles gold medal at 2018 World Men's Championships, registered the highest five-game series of the tournament of 1254 en-route to taking over top spot with a 15-game total of 3419. 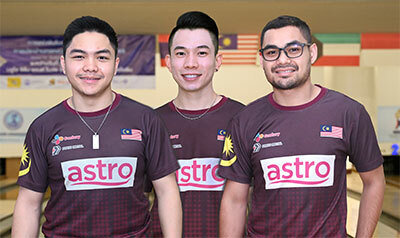 Squad A leader, Hakim had to setle for second spot with 3374 after a moderate 1001 in his final block while Ahmad Muaz completed Malaysia's dominance taking up third position with 3309. Squad D leader, Muhd Nur Aiman was pushed out to head the mixed pool with 3272. 2017 PBA-WBT Thailand World Tour champion, Yannaphon Larpapharat put in an inspiring 1141 in his third block in Squad D to leapfrog into top spot of the local pool with 3266. 2018 PBA-WBT Busan Cup champion, Annop Arromsaranon also improved to take up second with 3224. Overnight local pool leader, Surasak Manuwong hung on for third spot with 3183. The top 3 overseas and top 3 local qualifiers earned a bye and skip Round 2 finals. The cut at 26th position went to Lapasdanai Chusaeng of Thailand with 3093 while compatriot, Atchariya Cheng missed the cut by four pins. Timonthy Tham of Singapore (258), Brandon Ting of Malaysia (255), Lei Hok Hin of Macau (243) and Chiang Tsang-Yuan of Chinese Taipei (235) made the Round 2 finals in the Desperado squad. Malaysians also dominated the Women's Open division with Squad A first block leader, Sin Li Jane regaining her lead with a third block series of 1160 to take pole position with 3275. Overnight leader, Nerosha Keligit settled for second with 3157. 2017 SEA Games Masters gold medallist, Shalin Zulkifli topped Squad D en-route to finishing third in the overseas pool with 3100. Syaidatul Afifah of Malaysia missed the top bracket to head the mixed pool with 3069. Thanchanok Vilailak took over the lead in Squad B to finish top spot in the local pool with 2967. 2016 Thailand Open champion, Yanee Saebe, who had dropped into the mixed pool after the second block, bounced back with 977 in her third block to clinch second position with 2838. Kantaporn Singhabubpha claimed third position with 2799. The top 3 overseas and top 3 local qualifiers will skip Round 2 finals and automatically advance to Round 3 finals. The cut at 22nd position went to Lui Hsin-Ya of Chinese Taipei with 2782. Pitchapa Reongsiri of Thailand (219), Joy Yap of Singapore (213), Joan Cheng of Hong Kong (181) and Peng Hsion-Ting of Chinese Taipei (168) made the Round 2 finals in the Desperado squad. Men's Open qualifiers positioned 7 to 26 plus four from Desperado squad (24 bowlers) Women's Open qualifiers positioned 7 to 22 plus four from Desperado squad (20 bowlers) will contest the 6-games Round 2 finals tomorrow at 9:00 hrs local time. The top 14 men and top 10 women with the highest pinfalls will advance to Round 3 finals joined by the six seeded men and women qualifiers from the general standings for another six games. The top 6 men and top 6 women at the end of the Round 3 finals will proceed to the Stepladder Shootout finals.